This article first appeared in the May '12 issue of Learning Disability Practice. Hayley Goleniowska was initially devastated to learn her baby had Down's syndrome, but Natty is reaching her full potential and has taught her parents a lot about what the condition really means. I am the proud Mother of 2 gorgeous, confident, funny and popular girls. The youngest, Natty, also has Down’s Syndrome. All I could think when she was born was ‘This isn’t what I signed up for. This is not what I want.’ But of course, I had no idea what ‘this’ really was. As Natty’s 5th birthday approached, my thoughts turned to the crisp, sun-blessed December days just before her arrival when Mia and I planted bulbs together, enjoying every moment of Mummy and first-born alone time that would never be repeated in quite the same way. This was the time before our lives changed forever, the blissfully ignorant, arrogantly complacent time before we understood what life was really all about. When we shrugged off a 1/297 nuchal fold 'risk' (we now say 'chance' or 'liklihood') of having a baby with Down’s Syndrome as ‘not bad for my age’, (35) and clung to the notion that a healthy, clean-living, vitamin-taking woman would, of course, be expecting another healthy baby. She came early, as I felt she would. 2 weeks to be precise, typical for babies with Down’s Syndrome. The natural home birth was calm and straightforward. But a small, silent, blue baby was born, all in one easy movement. What followed is frozen in time. The look of desperation on the midwife’s face while my husband waited in shorts in a freezing lane for the ambulance. Jovial paramedics administering oxygen and helping me to the ambulance. The midwife repeatedly telling me how beautiful she was as I held the oxygen to her face, a face I could not warm to, could not recognise as being my own baby’s. Hindsight brings sharply into focus that all these professionals instantly knew that Natty had Down’s syndrome, but none of them could, or would, tell us. On arrival at the hospital, our baby was quickly taken from us to SCBU and we were ushered into a side room. I insisted that my husband stay at the baby’s side while staff worked on her. Bob still cannot talk to me about exactly what he witnessed and felt during the next 4 hours, save that on several occasions he can recall the code ‘DS’ being used. But a strange thing happens when you are faced with your worst nightmare. You dare not welcome it in. You dare not let your brain begin to work out that DS of course means Down’s syndrome. You absolutely will not let your head formulate a question to ask what is wrong, because you are terrified of the answer. If you don’t ask, it won’t happen. I was given no explanation of what was happening and I began to feel that I was being avoided. The panic rose. Our community midwife cried with us. I wanted to scream at him, make him and what he was saying vanish, but I could not speak. He asked me if I had suspected. I nodded. My core being had known all along. And all of this was done while ‘she’ lay in a distant incubator in SCUBU. I now understand the angst of those around me too, for medical professionals are also only human. But looking back, a gentle word of warning from a familiar friendly face might have taken the sting out of the thunderbolt. She was our beautiful but vulnerable daughter first, with her fabulous, exciting life ahead of her. But telling us she had Down’s syndrome amid tears and ‘sorries’ while she was out of sight and reach, meant that she became Downs’ syndrome Personified. My ignorance made her a frightening sum of all my stereotypes based on outdated glimpses into the lives of strangers with the condition, and the negative language and assumptions used by many in the medical profession compounded that. Key medical ‘angels' then came to the fore. The people whose faces and voices remain, whose influences are still felt in our hearts, yet whose names are long forgotten. Those who made us decide that our lives were far from over and that we would make certain both girls reached their full potential. The gently persuasive Sister who encouraged us to gradually look at, then touch and finally hold Natty. The kind nurse with a daughter with Down’s syndrome willing to share a family photo album with us. The Junior Doctor who announced that he just knew we would be ambassadors for children like Natty one day. The Midwife who wisely told me that my baby need my love whether she lived or died. The GP, whose grandson has Down’s syndrome. A no-nonsense man who welcomed her into his arms and coined her nickname Natty. Knowing Health Visitor no.2 (Insensitive no.1 was quickly bypassed) who had a child with a disability herself, who just ‘got it’. The calm breastfeeding specialist who guided us through 3 tube-fed, milk-expressing months until Natty finally succeeded for herself. Natty won our hearts, grew stronger, survived heart surgery and flourished, as her father always predicted. Her doting sister developed into a senitive, caring, intuitive young lady, due to, not in spite of, her sibling's disability. I began writing my blog, Downs Side Up, to offer support and encouragement to professionals and parents alike, for I know many of my initial fears were based in ignorance. Natty is now an ambassador for Down’s Syndrome in her own right, lighting rooms wherever she goes, smashing stereotypes, and even doing clothes' modelling and making advertising more inclusive. 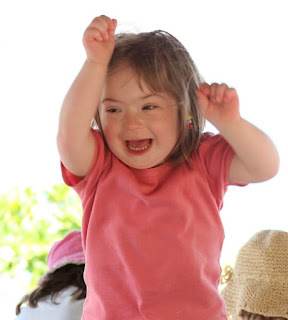 She lives and loves life to the full and shouts out that Down’s syndrome is beautiful and not to be feared. It is different, it can be unexpected, but it is never bad news, it is never a 'risk'. Paul, your site is brilliant. I now follow you on Twitter. This has made me cry but in a good way. So so so so so so beautifully written. I hopped here from your comment on In The Powder room and I am so glad I did. Oh bless you. See you this weekend in London? Thanks for dropping by. Hi we are sponsoring the BiBs Inspire Category that you are in and we just wanted to say good luck. I've just found your blog! I've a little boy of 2 who has downs. Like you it was a shock (understatement!!) but now when I see his wee face and hear him call for mummeeee my heart sings! Absolutely. Off to find you in Twitter, thank you for getting in touch. I have been here. But you write it better than I tell. My problem differs slightly as to the outside world my baby looks "normal" but he is my baby SWAN(syndrome without a name) and is amazing. He too is an ambassador like your beautiful daughter. I felt so much pain when I found out. I still grieve 3 years on but less and less each day. We are just mummies with different days but mummies all the same. After meeting you at Britmums Live only yesterday I just wanted to let you know just how much of an inspiration you are. Natty is truly beautiful! Your reading really touched me and I had to contain myself from running up to meet you on the stage and giving you the biggest hug ever! Well, you know I love you already and this post is so powerful. Tears in my eyes when I read about the prediction of you being an ambassador. Someone saw into the future there. Keep doing what you are doing but also looking after you in the midst of it all. Thank you Kate. Me? Yes, must remember that bit. Thank you so much for sharing your story and for your blog!! I'm grateful to you for taking the time to share your heart and your experience! I found you via Pinterest. Our sweet baby born with down syndrome was also born at home but we were very blessed in that she had/has no health issues at all. She was a week and a half late (which for me was early since my other babies were btwn two and three weeks late). I'm so thankful that we had no need to transfer to the hospital and her entrance into the world was able to be gentle and loving like my other births thanks to her good health. I feel so grateful and even a little guilty when I realize just how blessed we were in this bc it is so often not the case. Although I knew the moment I saw her, my sweet midwife was able to gently, lovingly and positively tell us her suspicions of DS. Personally I would have felt violated and deceived if she had known and tried to hide it from us. 3rd time lucky replying to you. I read your comment with a tear in my eye, for how it should have been for us but also with determination to make it that way for others to come. Would you consider writing a guest post for me? A positive account like yours would be very powerful. I cried the whole time that I read this article. My uncle was born with Down, in a time when children "like him" were placed in institutions. My grandmother refused, and raised him. Being a mother to a special needs child myself, (autism) I often think about what she went through, and wish that she had lived long enough to counsel me in these things. I parent my child while remembering her strength and determination that he experience every part of life. Aww, such a great story. It reminds me of my cousin, because this exact thing happened to her and my aunt. She recently graduated from elementary school (like all of her same age classmates) and is off to high school in the fall. Such a beautiful post. You express those feelings so well. I'm so happy for you all that you are living life to the full and challenging stereotypes.